The multiple Oscar-winning hit by the Cuarón brothers opened our eyes to an almost brand new style of cinema. The question now, two years on, is does it still have the same magic? And is it good enough to stand the test of time? Veteran astronaut Matt Kowalski (Clooney) leads a routine space mission to repair a satellite. The repairs are to be performed by Dr. Ryan Stone (Bullock), a newbie on her first venture into space. While performing the repairs, they receive news of a Russian satellite being destroyed, causing a cloud of debris to fly at them at harrowing speed. The debris kills everyone on the mission, and leaves Kowalski and Stone unattached, floating in the infinite space and fearing for their lives. We’ll get to the visuals and all that later, because that shouldn’t hide a pretty miniature story. The character – singular – comes across as a pretty interesting person, and if they wanted to make this into something bigger they could have focused more on her personal life. However, this film is made solely for space stuff, and you get the impression that her back story is really just filler, put in to stop this becoming some sort of technology ‘gimmick’. The 87 minute runtime is the biggest sign that there’s not much to this film past the visuals. 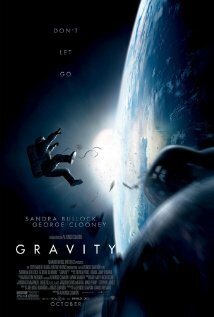 I enjoyed the performances in this film by Sandra Bullock and George Clooney. This couldn’t have been easy, with the film almost entirely shot in green screen studios at Shepperton and Pinewood Studios in the UK, the two of them delivered very convincing performances in difficult circumstances. The directing by Alfonso Cuarón is pretty good, however almost all of the work is done for him by the technology team. It is worth saying – although it has been said hundreds of times – that the visuals in Gravity are quite remarkable. You will have to go some to find a better, more real depiction of space than you find in Gravity, and it’s hard to believe anyone will ever be able do a better job of it. Not until 4D/IMAX style cinemas hit the mainstream, anyway. Gravity is still a pretty unique film, but not in a necessarily good way. I think what does this harm in my eyes is the fact it was nominated for so many Oscars, albeit not winning the major ones. To be nominated, and partly expected to win the Best Film Oscar means that you have created something remarkable. Which this just isn’t. Sure, the visuals are stunning, but the story has nowhere near enough depth and excitement for it to be considered a true classic.